A Federal Security Service (FSB) interim report to the Ministry of Emergency Situations (EMERCOM) and Interstate Aviation Committee (IAC) circulating in the Kremlin today states that it has confirmed from their initial investigation of the list of passengers and crew aboard FlyDubai Flight FZ981, that exploded early this morning in Rostov-on-Don, that this place was carrying a “high level” American Central Intelligence Agency (CIA) official who was travelling on a forged British passport using the name of Larisa Allen—and that aboard this plane too was an estimated US$27 million in currency. 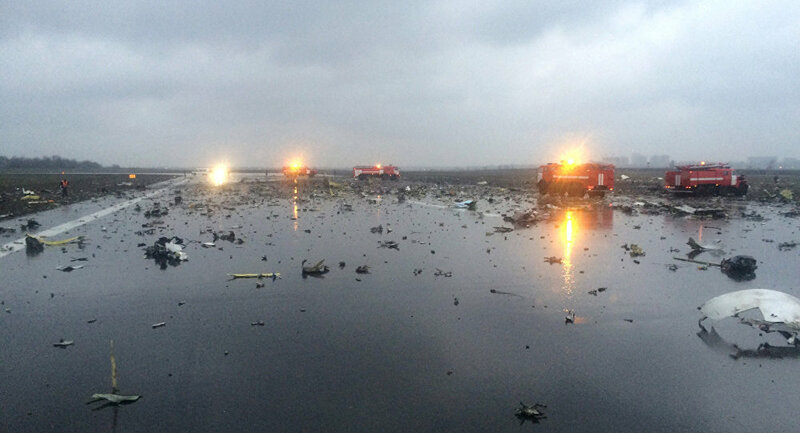 According to this report, this FlyDubai Boeing 737-800 aircraft that had taken off from Dubai Airport exploded this morning at about 03:50 Moscow time (00:50 GMT) while landing at Rostov Airport killing all 55 passengers and seven crew members aboard. Flights from Dubai to the Federation are common, this report says, as many young Russian females work is this most populous city in the United Arab Emirates (UAE) as “dancers” (i.e. prostitutes) with many companies advertising their “services”. With organized crime elements within the Federation (Russian Mafia) controlling the bulk of these “dancers”, and with Dubai having become a global centre for terror funding, money-laundering, drug money and mafia cash, this report continues, CIA fears that terrorist funds were being diverted to Russia provides the most likely explanation as to why one of their “high level” officials was on board this plane. As to how the estimated US$27 million in currency came to be aboard this plane packed into the cargo hold in “metal/aluminum” containers, this report notes, is currently being suspected by the FSB to have been “caused/effectuated” by the Cypriot pilot of this plane as the links between Cypress banks and Federation organized crime have long been known. With the IAC issuing a public statement that they have now taken control of this investigation, this report concludes, and due to the death of this “high level” CIA official, along with the millions-of-dollars found aboard this exploded plane, President Putin, who had previously expressed his condolences towards this tragedy, has authorized US, French and Dubai intelligence agencies to join it too. March 19, 2016 © EU and US all rights reserved. Permission to use this report in its entirety is granted under the condition it is linked back to its original source at WhatDoesItMean.Com. Freebase content licensed under CC-BY and GFDL.